Healthy Fajita Chicken with Bell Peppers is a super nutritious Chicken Dish, perfect for week night dinners! Infact, this Chicken Fajita loaded on veggies is one of my favourite pre preped healthy weekday meal! It’s got everything in it, enough protein, veggies, different textures and delectable spices to not be boring “Diet chicken” and veggies.I usually end up making a huge batch of this and eating it over several meals. These Healthy Fajita Chicken with Bell Peppers are spiced with my favourite homemade fajita seasoning made easily at home.Scroll down to see how I made it at home.Though if you are not into making things from scratch, feel free to use store-bought Fajita seasoning. Fajitas are very versatile.They are usually served with tortillas, avocado , sour cream and the other trimmings but it also goes famously with brown rice and cauliflower rice.They can even be served just by themselves, making it a whole30 and paleo approved meal! The trick in making a perfect juicy Chicken Fajita is sautéing the Veggies and Chicken separately. I know I already said this above, but its worth repeating! This my friends, is the most perfect chicken recipe for meal planning.I usually divide it in 4 borosil boxes, pop in some cooked quinoa or millet and a wedge of lime and just like that my 4 weekday healthy meals are done! Making the fajita seasoning at home is pretty simple.It’s simply a blend of dried thyme,garlic,coriander & cumin powder along with some smoked chilli powder or paprika if you are not that into chillies. I know a lot of you don’t stock all the above ingredients.I am an ingredient hoarder..lol..guilty as charged..So if you don’t have all these spices and herbs just buy readymade fajita seasoning.It’s really useful and you can make a lot of things with it! 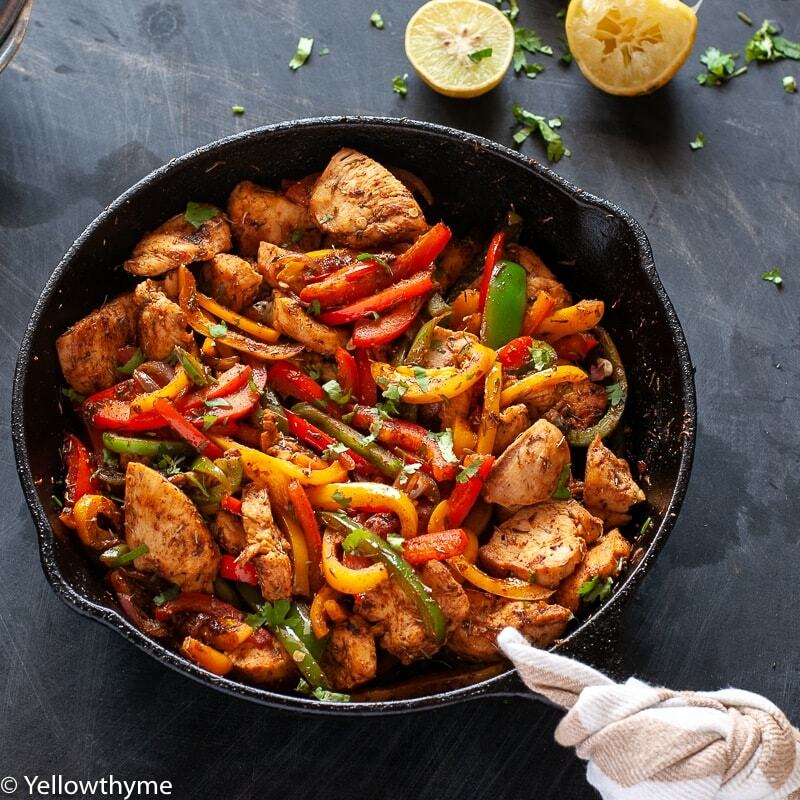 Healthy Fajita Chicken with Bell Peppers - Whole 30 and Paleo approved Chicken cooked in homemade Fajita Seasoning with red,yellow and Green Bell peppers. In a pan, heat half the oil.Add the chicken breast.Halfway through , add half the Fajita seasoning.Cook till done.About 8-12 minutes. Remove the chicken and put it in a bowl. Squeeze the lime juice over it. In the same pan, without cleaning, add rest of the oil.Saute the chopped onions for about 1 minute on medium flame. Add the bell peppers and saute for another minute.Add the cooked chicken in the pan. Mix and serve with rice/cous cous/Millets or Cauliflower Rice. Did you like this recipe? Also check out my other healthy chicken recipes from the blog!